Back to school time here in Atlanta. Mary Elle ate none of the turkey and cheese. They tried the Aged Cheddar in Trader Joes and had to have it. Get it home and they don't like it anymore. Typical. Salter was embarrassed that I dared pack cucumbers and goat cheese. He eats it at home but apparently not cool for school. Totally untouched. The small square is for a dessert or such. I didn't have one but plan on making healthy junk food for them today to take. 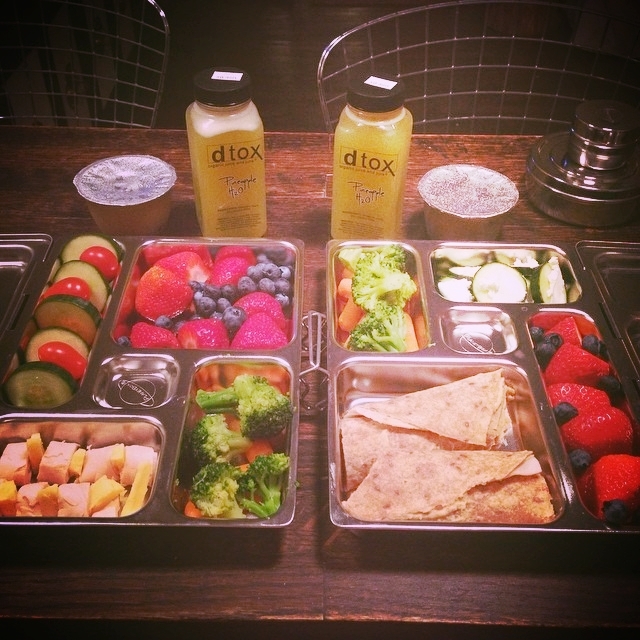 At DTOX, we have almond butter cookies, chocolate (cacao) and blonde macaroons, and raw granola bars. The junk at dtox seems to appeal more to adults than kids. An almond butter cookie and green juice is a great breakfast. Today, they both got 8 ounce Dtox Chocolate Milks. Made with raw cacao, almonds, alkaline water, dates, vanilla and pink salt, it's a healthy, all organic, dairy free option with tons of raw nutrition. With zinc, magnesium, iron, serotonin, vitamin E, protein, antioxidants, vitamin C, and all the omega 6 fatty acids, it's the perfect "treat".